Anyway, on to the real subject of this post – Rehabilitation. The rehabilitation process is an extremely important part of the Cochlear Implant journey – you have to train your brain to adjust to different sounds and pitches and learn to distinguish between male and female voices. The most useful way I have found to do this is just to fully immerse yourself into your environment, whether at home or at work. Try to introduce background noises such as the TV or radio whilst going about your chores or reading, to get your brain to pick up different noises. Talking to people, strangers or friends and family will help you to establish different pitches, tones and accents which is extremely useful. I put on TV programmes I had never watched before like Geordie Shore so I could distinguish an unfamiliar accent. My speech and language therapist has given me some fantastic online resources, I thought I would share a few of them with you today. I will share more with you in future posts, but do not wish to deluge you (or your brain!) with too much information. You do need to download this from your PC and it is not compatible with Mac computers or iPads. If you do not wish to download it, you can email them to request a CD version. 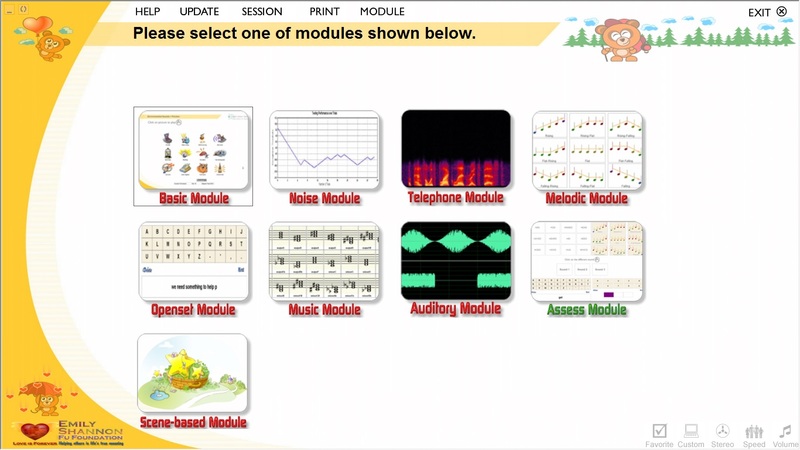 Basic, noise, telephone, melodic, openset, music, auditory, assess and scene based modules. 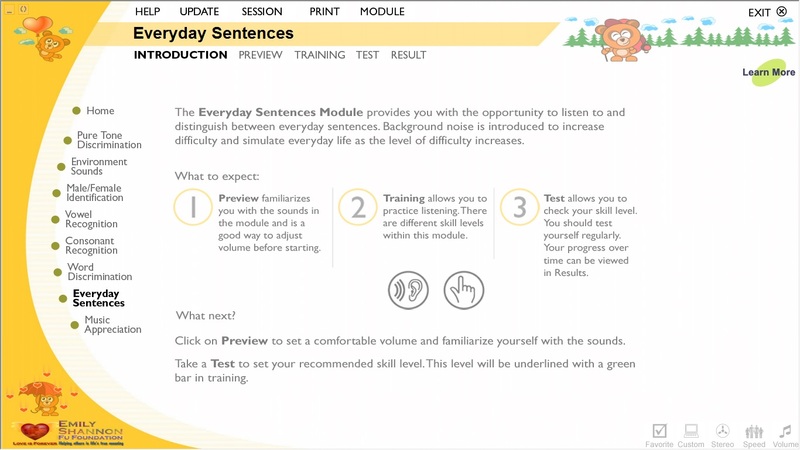 The basic module will give you an option of pure tone discrimination, environment sounds, male/female identification, vowel recognition, consonant recognition, word discrimination, everyday sentences and music appreciation. 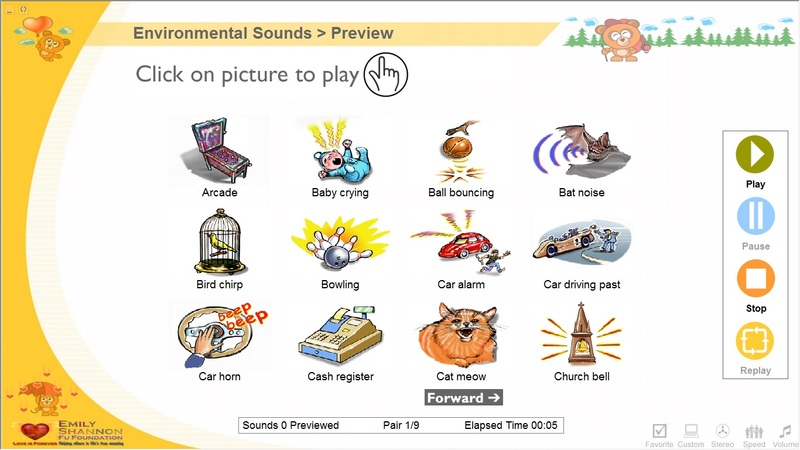 I would suggest that environment sounds, word discrimination and everyday sentences would be a good starting point as these are likely to be tools you will need in everyday situations. Every module/topic will give you a brief introduction as well as a chance to preview the sounds before you begin your training. It is worth previewing them before getting stuck into the tests. You will also be given a choice of levels from 1-4, 1 being the easiest and 4 the most challenging (generally at this level background noises will be present whilst the sentence is spoken). When the training/tests begin, you are given a choice of sentences and one of these will be spoken, you will have to determine which of these is the correct one. A word of warning – this is an American programme so the voices will be monotonous and I find, quite softly spoken. It helps you to develop a bit more awareness of noises that you may not be immediately aware of and that will mainly be background noises but just as important – although I’m not sure the bats are entirely relevant. The good thing about Angel Sounds is that you have those 4 levels so once you feel confident, you can progress. The tests are also a useful tool for you to be able to determine your own personal progress without the pressure of a proper test environment. 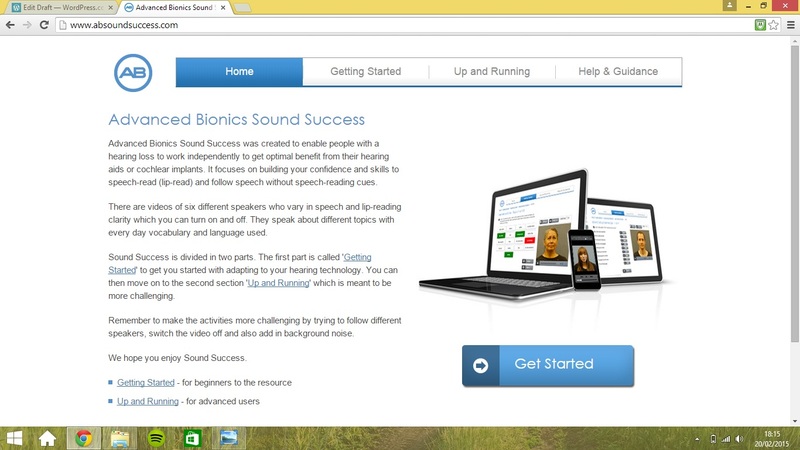 You can obtain a free one month trial from your audiologist (they will be able to give you a code to access this). This is mainly for Advanced Bionics users, hence why I have only got a one month free trial (which has now expired) but is useful nonetheless. This is a good tool if you wish to practice listening to other people having a conversation, for example, they give you a variety of topics to choose from and different speakers (i.e. you can choose whether you would prefer to hear a male or female, young or old speaker) and a video will play showing two individuals having a conversation on that particular topic. Following the video you will be asked a few questions on what they discussed. It tests both your memory and your listening skills as often the videos are lengthy and sometimes there are 3 or more questions. I personally did not like this particular tool as the two speakers were clearly speaking slowly and over enunciating for the video which to me, felt too contrived. You do however, have the option to turn the video off and just listen to the speakers which I feel is a bit more challenging. The other thing which I didn’t find as useful, is that you only really have two options for levels – “getting started” and “up and running” – there is little difference between the two in terms of difficulty, it just seemed to me that there was more choice on the up and running section. I am not sure if this is because I only had a limited version of this, perhaps if I was an Advanced Bionics user there would be more options open to me but it is worth using despite this. I hope this has been helpful – until next time! I am wading through the horrid flu but able to blow my nose to an extend ☺ however the above is utterly invaluable to me. My brain is still resistant against new sounds after a lifelong severe deafness. The morning routine of switching on my AB processor involves cringing and more cringing until things become bearable. I am so fascinated as to why my brain is so fussy after all the great achievements from the pre op hearing level of 7% to the grand level of 80% intake. All this after twelve months since surgery. Early days yes early days.